To be honest my 500 and 400-4 are wanting more alternator. I wish to have a little extra cash available when one of those mechman used ones for the ls motors comes across the classifieds. It's a 09 model that my friend had on an l7 for years. He smelled something when it shut off. I opened the cover and one of the input fets i believe it is, is burnt. There's 6 input fets and in front of each one is a small black gate resistor i think. The board around most of them dudes looks to have been getting warm as well. Everything else looks perfect so I'm sure kicker can hook me up for a decent fee. Anyone know anything good or bad about these amplifiers? I've never had any kicker stuff. severancej replied to JetSetJones's topic in General Audio - Can't find a category for your question? Ask here. Hey Jones your buddy Cody with the gto at OReilly told me u had a nice setup. I've got a gxp too, seen u on lstech as well. I stay in hamilton, we should all get together sometime. I'll let you hear my setup in my truck. I would think you could do 4 12s in 8cubes net on 2k and port up through rear deck. That'd be bad! What amp and electrical do you got going on? I'd imagine they get pretty damn loud. I've been seriously torn around the 750rms range. Ive Been wanting to change it up from these sundown E12s and have always looked at the ssd and q along with the chaos too. I Haven't seen the x mentioned much at all. severancej replied to BerT6801's topic in General Audio - Can't find a category for your question? Ask here. Maybe it's a ground loop problem? You could Try this, get your power and ground from your distribution blocks and daisy chain it to your kicker crossover (if it even needs 12v) and up too your head unit. That way everything is using the same chassis ground. 10 / 12" Line "Below" E Series ? severancej replied to sundownz's topic in Sundown Audio - GREAT Amps/Subs! GREAT Customer Service! Awesome man! I really like what my 2 e12s can do hopefully you can get where you want with this, and I'm sure if you do it'll be perfect. I assume these would be by far the best entry level budget woofers on the market. severancej replied to Bass520's topic in Member Rides & Builds -- Show off your whip, Show off your System! Really nice work man! I wish i could hear that thing haha. Im looking forward to seeing more from ya. 73 Nova, 300w RMS to SA8v2 enough? 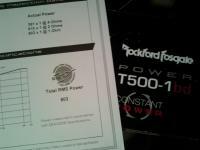 My Rockford P400-4 is rated at 50x4 @4 ohms...100x4 @2 ohms and requires an 80amp fuse to be installed. I'm not sure i can believe the specs are accurate on that massive. SA X 10" New Amp? I would contact mtx and get the info on pricing, I once had a thunder x600 that stopped working right, they offered a flat rate replacement or fix if possible i want to say it was about $125 man. Myself.. I went ahead and had them fix it. They sent a new one that worked great for months until it got stolen out my truck... Fkuckin sucked Anyway yu should call mtx Db-r is another business that comes to mind.. Have a look at their website.